Local leaders on the Sacramento Valley floor are well organized and coordinated with respect to groundwater management and the efforts to implement the Sustainable Groundwater Management Act (SGMA). Local Groundwater Sustainability Agencies (GSAs) are all working hard to manage groundwater in a sustainable manner with a focus on completing the initial Groundwater Sustainability Plans (GSPs) by January 2022. With the emphasis on local agency implementation of SGMA, we have asked many of the local leaders to provide their perspective on local groundwater conditions and the management necessary to manage water resources in a sustainable manner. 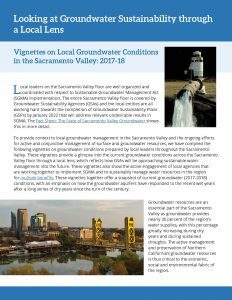 These local perspectives over the past year from throughout the Sacramento Valley are compiled in Looking at Groundwater Sustainability through a Local Lens: Vignettes on Local Groundwater Conditions in the Sacramento Valley (2017-18), which can be accessed by clicking below. These local vignettes provide a snapshot into the groundwater conditions through a local lens and they shape the efforts that are underway through SGMA to address undesirable results in these areas. This information will continue to be updated as new data becomes available. Additionally, the Department of Water Resources (DWR) has complied similar information on its elevation change profiles for parts of the Sacramento Valley. These can be seen here. The Fact Sheet: The State of Sacramento Valley Groundwater is available here.